This year’s conference was the first held in a new political set of circumstances, exacerbated by events upon our pale (perceived paler) blue dot. Environmental happenings. Societal happenings. 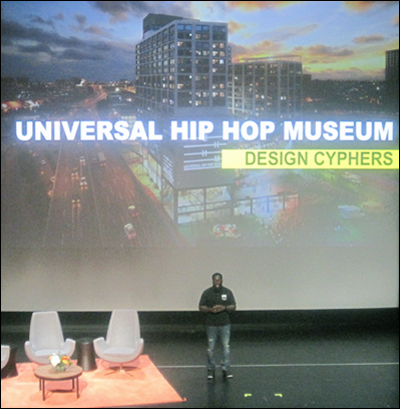 Cusp 2017 had a ripped-from-the-headlines aura. With the auditorium typically dimmed, the stage—for the tenth time—was conspicuously lit by Presenters selected for their Cusp-charged qualities in going against the grain in their line of work. Exceeding the mainstay of legacy systems. Refusing to stick with anemic thinking. Reimagining different scenarios that assure, uplift. All attempts to counter the narrative of generational challenges, accruing in dominance. 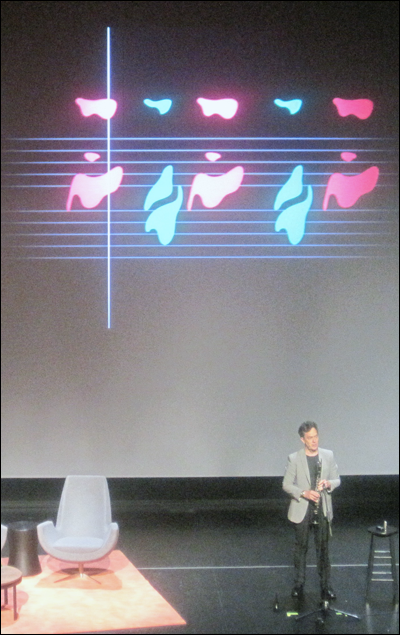 This year’s Cusp Presenters amplified the residual uncertainty of the times. From the Cusp 2017 presentations, these counter narratives curdled in recognition for me. Counter narratives helmed by individuals, not intimidated by the dominant context of convention in their respective disciplines. All the hype about traveling to Mars (a one-way trip) and migrating a million-or-so people there to establish a human outpost does capture the imagination. At the same time, its subtext could read: On it’s current path, the Earth is in peril—best to start the interstellar process of mass transit while the planet remains survivable. Sensitivity to the state of the planet—the only one known to harbor human life (illustrated lucidly by Real Time talk show host Bill Maher in his Earth-Mars comparison chart)—was elaborated again throughout the 10th Cusp. 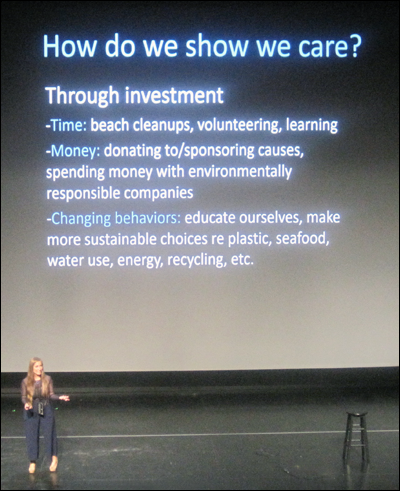 Aquatic Biologist Alex Rose dived (pun intended) into the critical importance of our oceans, declaring one fact taken for granted: “The ocean produces half of the oxygen we breathe.” Her passionate zeroing in on the Earth’s oceans points to the essential part it plays in a medley of cosmic systems that make the planet habitable to humans. An astounding reality. Rose’s presentation was void of apparent alarmism, a typical indictment from climate-change deniers/skeptics to the consensus of evidence that climate change is caused by human-consuming, carbon-intensive activities. Instead, she showed appreciation for oceans through captivating photographs displaying the incredible range of underwater biodiversity, which human beings, above ground, descend from and are a micro-subset of. When one views the ocean, there is a sensation of feeling small. A poetic fact presented by Rose: Oceans and humans have a direct bond—with the latter depending absolutely on the other. Though toggling unfortunately between being subject to neglect and upkeep, Earth’s history is the basis for that of humans. Before Rose’s celebration of the majority of the Earth’s surface and the plea to help curb its deterioration, the field of engineering took the Cusp stage. Dr. Nina French presented her company’s work on an in-pipe hydropower mechanism to convert vast chunks of infrastructure, intertwined with gravity-fed water pipelines around the world, into generators of clean, renewable energy. Felipe Gómez del Campo presented a tweak he designed for jet engines that conserves great amounts of fuel. This is especially nifty when used by planes in thick procession on runways, congested with long wait-times. French and Campo both use their work to press the “Edit” button. Through collaboration with their teams, inventive adjustments prove again the phenomenon of small edits yielding large results, compounding in benefits, testifying to there always being room for improvement. Based on the representative moves by Dr. Nina French and Felipe Gómez del Campo on realizing environment-friendly machines, the parity persists between the tireless human reclaiming of nature’s integrity to the tireless human desire to tinker with the artificial toward minimizing hazards and waste. As the building blocks of language, the poet T. S. Eliot described the precise behavior of words as “slippery.” This reputation does not deter Hip-Hop linguists Kevin Coval and Michael Ford from taking full advantage of words—versatile in color, geometry and tone. Using them to clarify conditions, elevate their dimensions—to live, see and interpret such times. Hip-Hop is their way to bring on situational awareness. Aligned to Ford, poet Kevin Coval dubs himself as a “hyperliterate word nerd.” In words, Coval finds, as he put it, “power and sanctuary.” Where Ford found Hip-Hop in post-war architectural ideologies and styles, Coval found Hip-Hop in his Jewish upbringing, particularly the traditional chants and songs. The appeal of words struck him early on. He affirmed, “I knew I wanted to be a writer.” Fast forward to 2001 when he founded The Chicago Youth Poetry Festival. This event has become a honorable vehicle for ethnically diverse, working-class adolescents and teens to outface their struggles—and express their American experiences through the moving medium of words. Ford and Coval reminded the audience about the relevance of words: its therapy, its adaptation, its reach. Both are contributing formidably to the ancestral responsibility of using words to create safe spaces—safe regarding personal well-being, but not stifling in personal expression. Words, tied to good intentions, are kernels of human possibility. In a trivial world, words are clay to build a storied architecture of sanity. Sanity’s chief by-product is stability, sharply in need as 2017 rolled out. The Cusp Conference emphasized again the tremendous courage and will of individuals who demote hell by raising humanity. 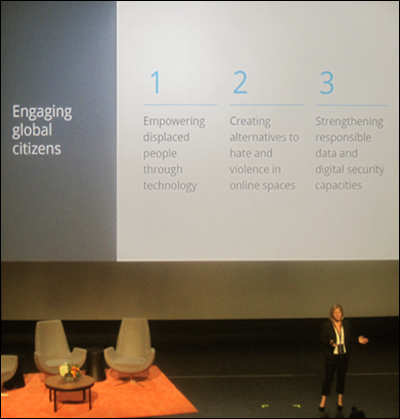 From her Cusp presentation, PeaceGeeks’ Founder Renee Black is collaborating with various grassroots groups to mobilize awareness and action in tackling conflict and disaster-stricken communities worldwide. Attention particularly given to responsive compassion in Africa, the Middle East and Asia. Apparent in Black’s work is using the latest iterations in mobile technology, from social-media platforms to drones, to help the impoverished, the malnourished, the sick, the displaced. 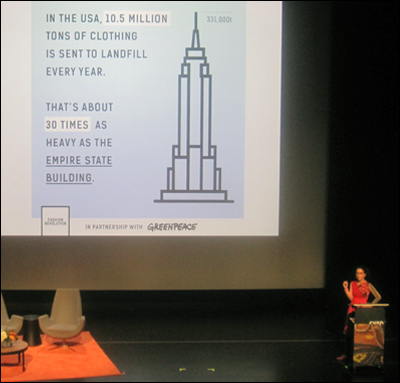 This reminded me of The Consume®econnection Project started by Scott Ballum, a graphic designer and sustainable business advocate. In 2009, he self-initiated a year-long experiment to meet the people who produced everything he bought, from coffee to liquor to T-shirts, focusing on traceability, local purchasing and conscious consumption. Ballum took on practicing de Castro’s rally of “Who made my clothes” and applied it to other objects enriching his life. Activating a keen observation expressed by the pioneering designer-couple Ray and Charles Eames: “Eventually everything connects—people, ideas, objects.” Throughout this moment-to-moment trifecta, the quality meditated: Humanity. Iver’s overarching prompt of turbulence-to-triumph is ambitious. Yet, those—who shared their world views on the Cusp stage—keep the impossibility of achieving such a dynamic at bay through their energies—steady and persistent, expended to execute the shared strategy of trying to change a piece of the world for the better. This is the true definition of miraculous. After the conference, amidst thanking again the principals of Multiple, who organized the 10th Cusp (their event’s lean and motivational meme), and walking from the conference’s flagship venue of the Museum of Contemporary Art in Chicago, where Frida Kahlo’s first U.S exhibition was held in 1978, while my head was buzzing and wafting with perspectives from twenty-three Presenters across two days, the intention to continue being less ignorant, less complacent, less selfish, was given several boosts. From one’s armchair to elsewhere, be open to introspection about the nature of things—of ourselves. People are cabinets of creativity—Dream and do. Remove history’s malignant plaque of exclusivity by contributing to the collective grasp of diversity everywhere. Utilize vulnerability—sketch, state an opinion, ask questions—to help build trust and hope. Cusp co-owner Andy Eltzroth compared experiencing the conference to that of “having dessert and then you give me more.” I’ll indulge in another multicultural, multidisciplinary trifle. 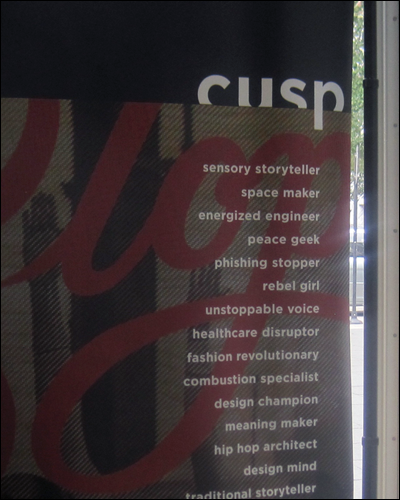 Big thanks: to Multiple, Inc., and the volunteers who made Cusp Conference happen in 2017; to the Museum of Contemporary Art, Chicago, for hosting.